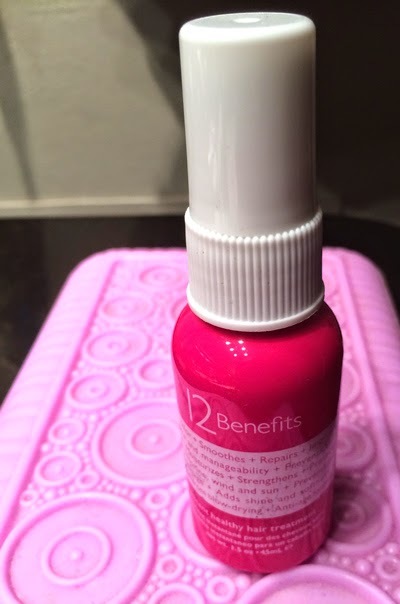 THE SKINNY: I had never heard of the 12 Benefits line of products until I got this little bottle in a recent Glossybox. But 12 Benefits Instant Healthy Hair Treatment is a keeper. This leave-in goes on wet hair before styling to help correct damage and protect your hair (including color!). The 12 benefits include: Seal hair color, smooth frizz, repair damage, prevent split ends, moisturize dry hair, strengthen fragile hair, prevent flat iron damage, prevent chlorine, wind and sun damage, add shine, softness and a silky finish, protect hair from blow-drying , improve detangling and manageability and keep hair youthful. I can't attest to them all but I love that this product fights the frizzies and winter static. That alone makes it a great find in my book! CHECK IT OUT: Learn more about this brand if it's new to you (it was for me).